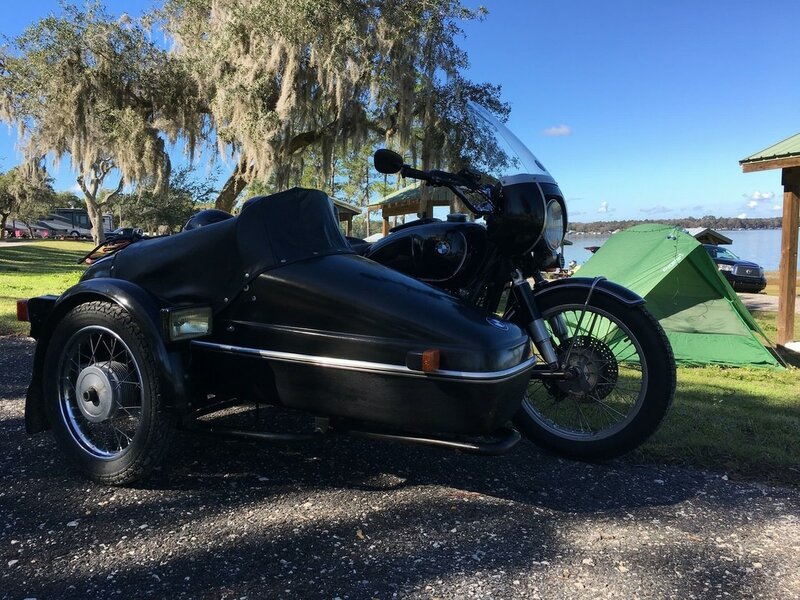 This was the fifth time I pointed my bike south to head to the Northeast Florida BMW Rally. This rally is always the first each year and it is held over Martin Luther King's holiday weekend. It is always nice to be able to ride in the warm Florida sunshine in January! Usually I am bundled up in all the gear I can manage with my heated jacket and gloves set to medium well as I ride. This year's unseasonably warm weather allowed me to take Route 68 from my home in Maryville through Tellico Plains and into the north Georgia mountains. The light mist didn't bother me since the road was curvy with little traffic that early Wednesday morning. I picked the HOV lanes on I-75 and flew through Atlanta mid-day. Since I was running a little early to meet my friends from the BMW Riders of the Mid-South club, I hopped off the interstate and took back Georgia blue routes to enjoy the day. I stopped to visit the Andersonville Historic Site where an estimated 13,000 Northern prisoners of war died during the final 12 months of the Civil War. The museum there features information on that site and serves as a POW memorial for all American conflcits. It is worth a visit if you are in the area. 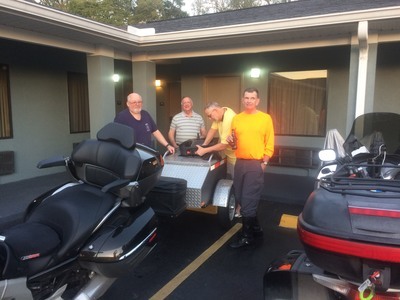 The first night was spent at the Albany, GA Red Roof Inn where I met 5 of my Memphis area friends. Since they arrived late, we decided that a in-house pizza and beer party was the best option. 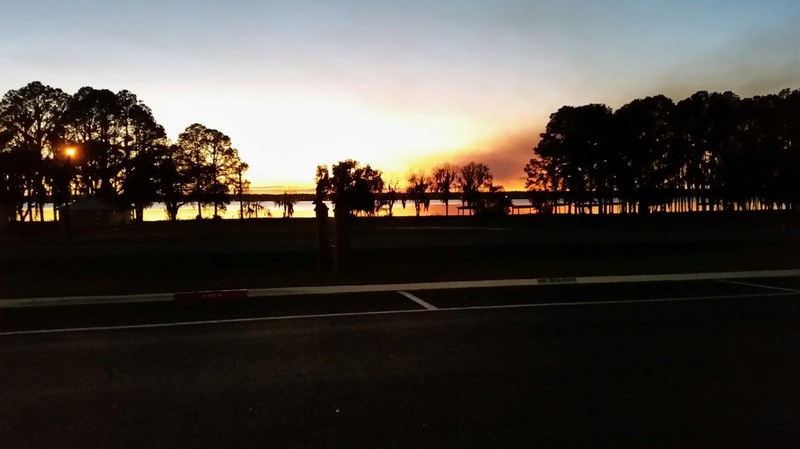 The next day, it was a easy four hour ride into Starke, FL. We don't take advantage of the camping offered on site but stay about 6 miles away in a local hotel. 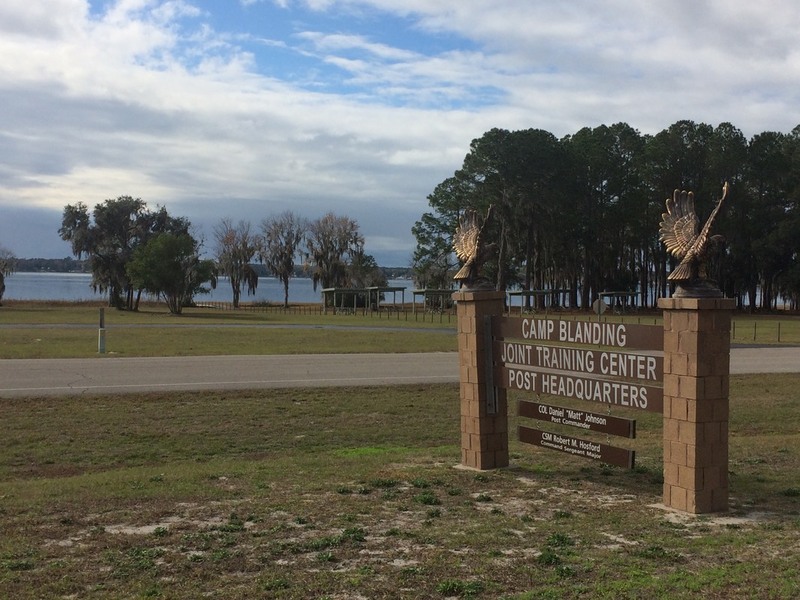 Our group, now grown to 7 riders, arrived early Friday morning at Camp Blanding, our rally site. 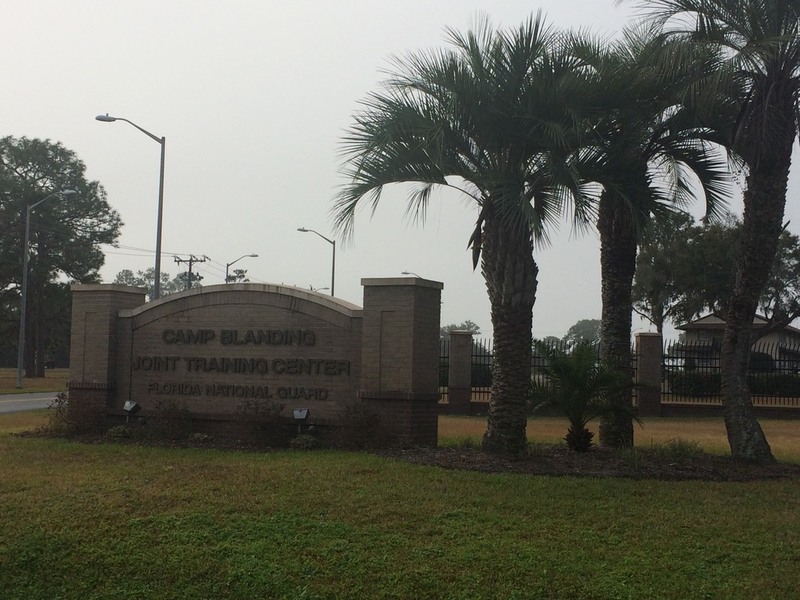 This large military base is now a Florida National Guard training site. It does have an excellent WWII museum at the gate. This rally requires pre-registration, so no ride up attendees are allowed. You have to show ID and have the proper riding gear including reflective material to access the base. My Darien jacket fits the requirement. The base offers an excellent rally location with lakeside camping, a large hall for gathering and meals, and an on base PX store selling adult beverages. Dinner is served both nights to the 500 attendees. Brats, hot dogs, and sides for Friday night and a steak dinner for Saturday night. All meals are prepared and served by club members. 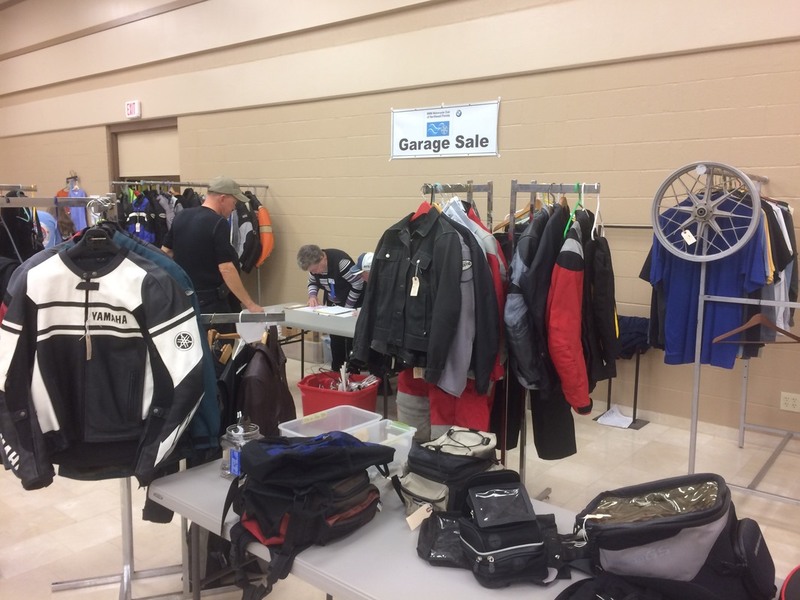 One of the features we love at this rally is their garage sale of used items. There is a wide varierty of clothing, tools, parts, and miscelleneous items to purchase. It is unusual if we find something we didn't know we needed! Our traditional Saturday ride sends us to St. Augustine for a early seafood lunch at O'Steen's Restaurant. Fantastic fried butterfly shrimp! Normally we head south to ride route A1A along the beach to Daytona but this year one of the riders was having electrical problems so we returned to base. While there are not many hills or curves to ride in Florida, there is something to be said for riding along the shore! On Sunday we say our goodbyes and head out early to deadhead ride home. I turned my bike north and headed the 492 miles up I-75 and Route 411. I recommend that you consider attending this rally in 2018. Pre-registration starts in mid-October and it usually sells out by early December.